A Senior Operations Analyst identifies and solves the business requirements and needs by analyzing the operations and processing the problems. 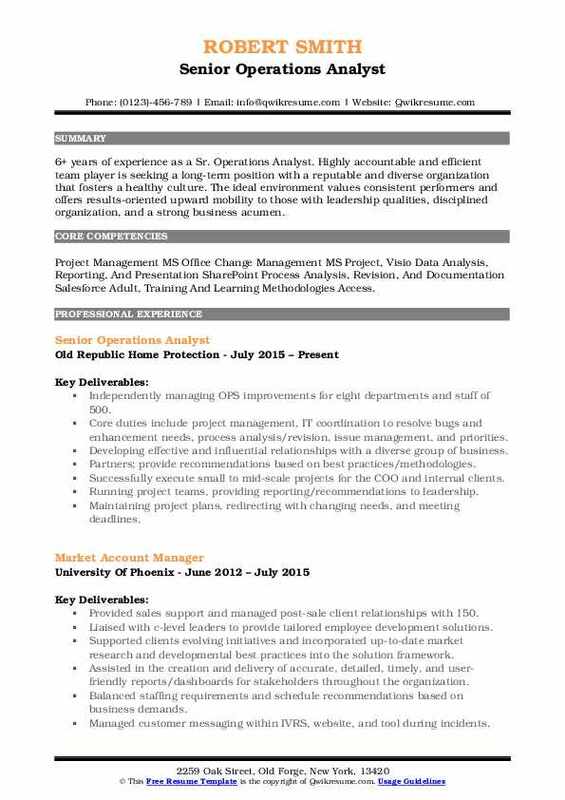 Duties commonly listed on the Senior Operations Analyst Resume are identifying the needs of the company, analyzing operations, documenting results, describing workflow charts, preparing system specifications, identifying and developing project estimates, preparing ad hoc reports and presentations for management and stakeholders, ensuring that the daily operations align with the defined business strategies and verifying the results derived from tests. Senior Operations Analysts should have proven ability to multitask and depict a high level of organizational skills, on the technical side; they are expected to be well-versed in Microsoft Excel and SQL. Most of the candidates seeking to make a career path in this line of operation embrace a degree in Finance, Accounting or related field. Possessing an MBA is, however, a strong plus. 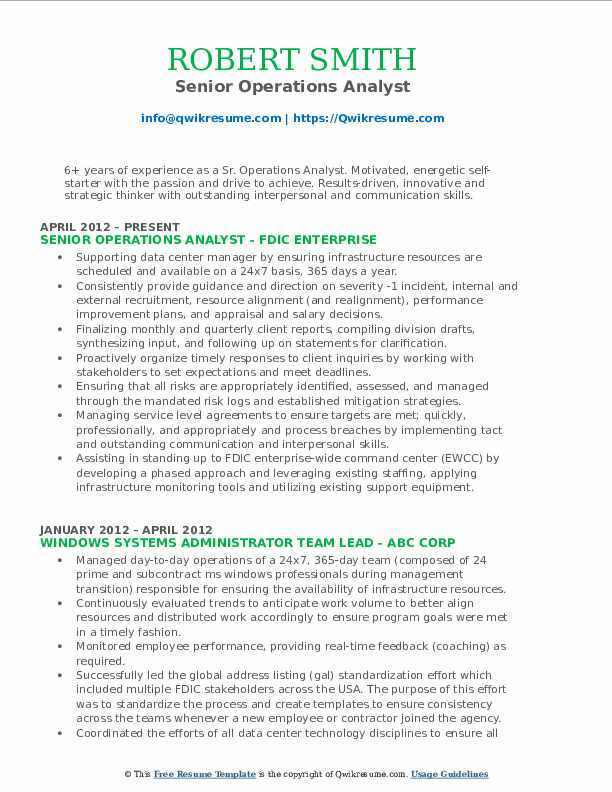 Summary : 16+ years of experience as a Sr. Operations Analyst. Highly dedicated, self-motivated Senior Operations Analyst / Loan Specialist / Customer Service Professional with increasingly responsible career and proven success as a viable team and contributory member. 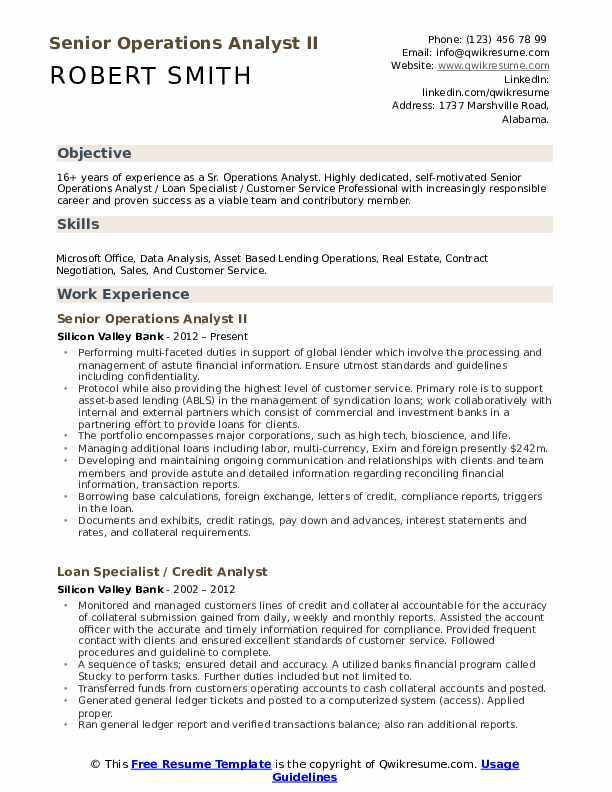 Skills : Microsoft Office, Data Analysis, Asset Based Lending Operations, Real Estate, Contract Negotiation, Sales, And Customer Service. Performing multi-faceted duties in support of global lender which involve the processing and management of astute financial information. Ensure utmost standards and guidelines including confidentiality. Protocol while also providing the highest level of customer service. Primary role is to support asset-based lending (ABLS) in the management of syndication loans; work collaboratively with internal and external partners which consist of commercial and investment banks in a partnering effort to provide loans for clients. The portfolio encompasses major corporations, such as high tech, bioscience, and life. Managing additional loans including labor, multi-currency, Exim and foreign presently $242m. Developing and maintaining ongoing communication and relationships with clients and team members and provide astute and detailed information regarding reconciling financial information, transaction reports. Borrowing base calculations, foreign exchange, letters of credit, compliance reports, triggers in the loan. Documents and exhibits, credit ratings, pay down and advances, interest statements and rates, and collateral requirements. Providing full-scale analysis on each company for preparation to the loan officer. Summary : 15+ years of experience as a Sr. Operations Analyst is seeking a challenging career with a progressive organization which will utilize my skills and experience to improve operations, increase profitability, and enhances growth. 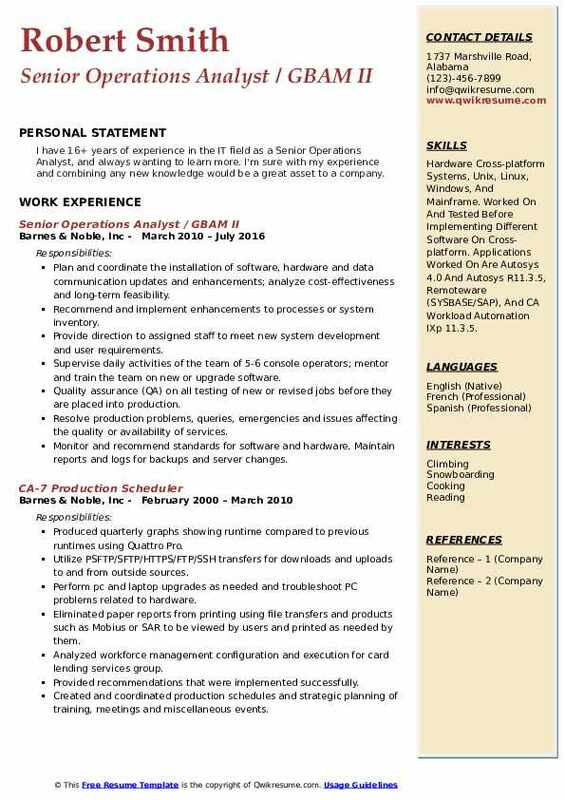 Skills : Computer Proficient In SAP, PeopleSoft, AS400, Oracle, Lotus Notes, Adobe Microsoft Office: Word, Excel, Access, PowerPoint, Outlook Express, And MS Project. Responsible for the development, implementation and continued management of performance measurement tools and analysis. Developing and maintaining business metrics covering all aspects of the business including capital expenditures, revenue, operating costs. Identifying potential areas for improvement in processes and systems support. Performing business process reviews, analyze workflows, and assess fit-gaps. Monitoring customer behavior to develop guidelines and prepare points of view used in forecasting trends and formulating policy related to a company's market and retention activities. Performing audit reviews in their respective function to ensure all strategies and processes are being executed as designed and perform root cause analysis on trends against these strategies and processes. Serving as a point of contact for requested changes to the account inventory assignment or strategy. Facilitating division-wide projects affecting account treatment and inventory diligence while assessing the impact of new processes, queue requests, and strategy changes to current flows. Steering and coordinate changes to policy, strategy and other impacted functions. Performing ongoing market-specific customer, product, and competitive analyses. Extract data from relational databases; apply business quantitative models to compile, analyze and report data to explain customer behavior and economic impact on operations and retention activity. Facilitate product launches, process changes, special campaigns, customer retention strategies and evaluating their effectiveness. Summary : 16+ years of experience as a Sr. Operations Analyst is looking forward to joining a growing organization that utilizes my marketing background and expands my sales and customer service experience while offering the opportunity for personal and professional growth. Skills : Real Estate, Contract Negotiation, Sales, Customer Service, Word, Data Mining, Database, Project Management, Business Analysis, And Data Analysis. Creating new desktop procedures and policies that meet bank of Americas risk and control framework using established consistency guidelines. Performing task analysis and impact assessment to understand process details and user impacts via WebEx meeting. Interviewing and partners with subject matter experts, asking probing questions, following up on gaps and verifying information to overcome obstacles, negotiate/collaborate and gain group consensus. Performing due diligence to determine the impact on other lines of business and existing procedures. Interacting extensively with business partners to research, identifying, analyze and execute projects. Developing project plans those outline deliverables and the timeline by which they are due. Working independently on several projects simultaneously, of varying complexity. 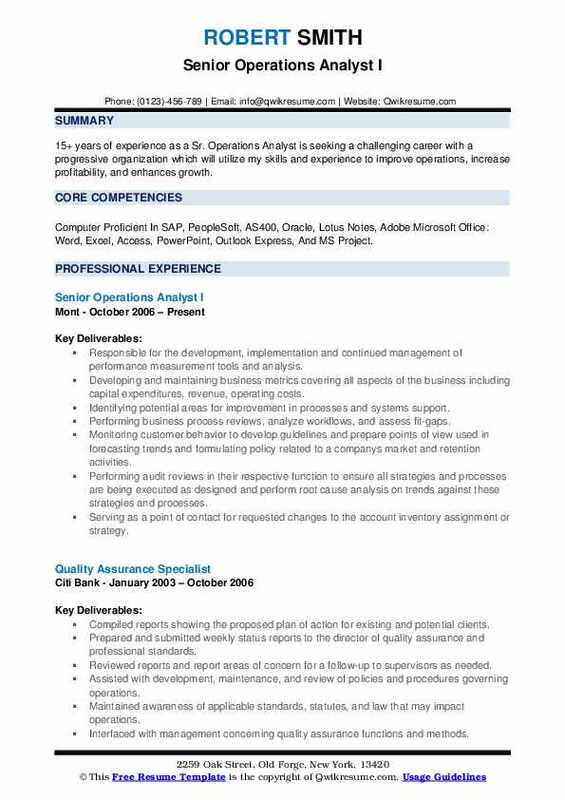 Summary : 13+ years of experience as a Senior Operations Analyst. Technically sophisticated professional fostering and leading innovation that dramatically accelerates the advancement of technology and sound practice to produce novel capabilities with the measurable return. Skills : Excellent Managerial, And Planning Skilled Military Simulation, Systems Instructor, Proficient In MS Windows, Adept In Microsoft Excel, PowerPoint, And Word Programs, Secret Government Security Clearance. Supervising a team of training integrators and directly manages their daily work assignments and training schedules, travel requirements, and vacation / leave time. Maximize organizations organic collective training capability and throughput - over the last few years. 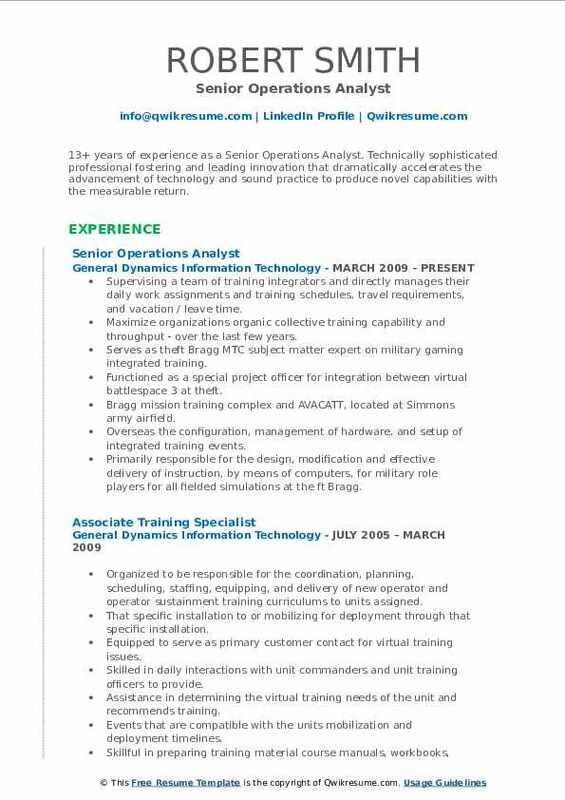 Serves as theft Bragg MTC subject matter expert on military gaming integrated training. Functioned as a special project officer for integration between virtual battlespace 3 at theft. Bragg mission training complex and AVACATT, located at Simmons army airfield. Overseas the configuration, management of hardware, and setup of integrated training events. Primarily responsible for the design, modification and effective delivery of instruction, by means of computers, for military role players for all fielded simulations at the ft Bragg. Mission training complex, to include: joint land component constructive training. Summary : Established leader as a Senior Operations Analyst with 15 years of experience, is able to coordinate multiple projects and effectively meet deadlines in a fast paced environment. Proven ability to manage risks and assess market exposure while improving productivity and accuracy in post-execution domestic and international components. Skills : Microsoft Office, Excel, ADP, Alert, DTC, GBOI, CTM And Fidessa Trading Platform, Customer Service, Data Mining, Database, Project Management, And Business Analysis. Lead operations analyst on the development and integration of RBCs global back office system (GBOI). Partnered with it to develop macros which are used for multi-correction and allocations through trading systems. Developed manuals which described and outlined standard operating procedures, which focused on risk exposure for any post-execution and settlement activities. Managed assigned client accounts, open accounts, CDC screenings and reviewed paperwork for compliance and AML regulations. Assisted equity traders with order flow and interacted with brokers and various exchanges. Generated and distributed open fail reports on excel for multiple clients and prime brokers to manage and reduce falls. Reviewed and implemented control requirements to ensure client straight through processing (STP). Corresponded with traders to ensure the accuracy of positions and daily (PL) balancing. 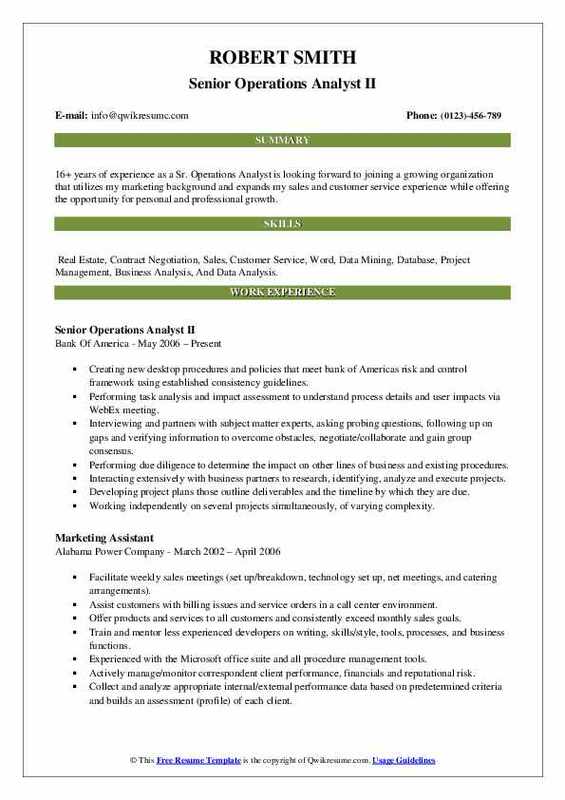 Objective : One year of experience as a Sr. Operations Analyst. Motivated, personable, results-oriented business professional with a successful track record in the business management, budget management and reconciliation, warehousing and IT technologies, including managing operations in both union and non-union environments. 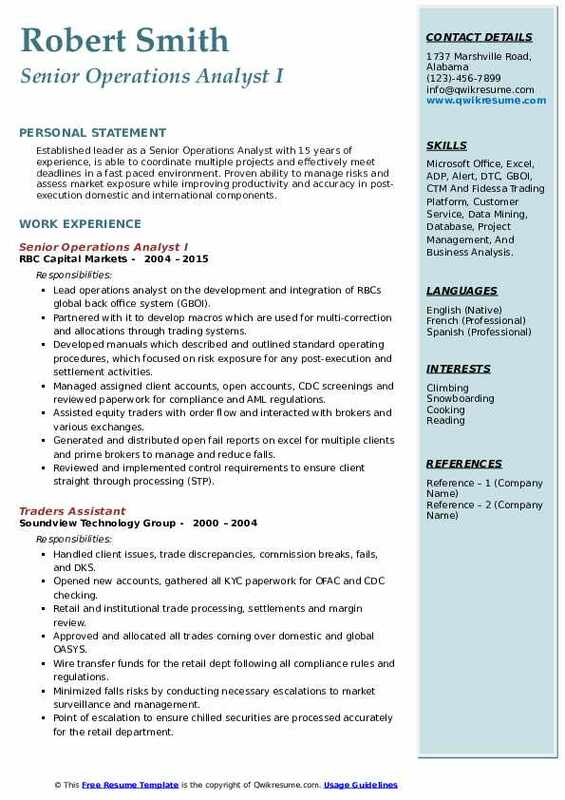 Skills : Computer McKesson, ODBC/T SQL, Teradata, Filezilla FTP, Business Object Tools, Crystal Reporting, Share Point, Windows XP Server, Yardi Voyager, Property Ware, Maestro, Customer Support, BPMN, Microsoft Office Suite: Excel Power User, Network Support, PC Hardware/ Software Installation, Systems Administration, Access, Visual Basic, And IT Help-desk Support. Worked with operational leadership to understand reporting requirements for call center and in-community healthcare plans operations. Acquired knowledge and understanding of customer contracts and delivery models in order to support initiatives and outcomes for innovation and customers. Assessed, planned, developed, and modified current tracking tools and reports related to call center staff and leadership activity. Initiated, developed, and delivered a plan of action to leadership related to projects, processes, and development for health information management. Implemented and evaluated the effectiveness of tools and continually monitor for enhancement opportunities and improvements. Used SQL to develop checks on data profiling, data validation, trending, baseline, data standards and data cleansing. Worked with both IT development and operations to ensure proactive quality checks in a timely fashion. Conducted post-production duties and activities: re-test, reassess metadata and update required documents as necessary. Defined and refined data quality checks and data monitoring supporting the business rules and changes. Provided support in the use of healthcare data within the product portfolio, and provide subject matter support to product design and development initiatives. Provided support in the surveillance of data integrity within innovation and services and supported the design and development of tools to provide an ongoing improvement of visibility into and detection of integrity issues within innovation product and services. Headline : 6+ years of experience as a Sr. Operations Analyst. Motivated, energetic self-starter with the passion and drive to achieve. Results-driven, innovative and strategic thinker with outstanding interpersonal and communication skills. Skills : Customer Service, Data Mining, Database, Project Management, Business Analysis, Data Analysis, Order Entry, Corporate Actions, And Time Management. Supporting data center manager by ensuring infrastructure resources are scheduled and available on a 24x7 basis, 365 days a year. Consistently provide guidance and direction on severity -1 incident, internal and external recruitment, resource alignment (and realignment), performance improvement plans, and appraisal and salary decisions. Finalizing monthly and quarterly client reports, compiling division drafts, synthesizing input, and following up on statements for clarification. Proactively organize timely responses to client inquiries by working with stakeholders to set expectations and meet deadlines. Ensuring that all risks are appropriately identified, assessed, and managed through the mandated risk logs and established mitigation strategies. Managing service level agreements to ensure targets are met; quickly, professionally, and appropriately and process breaches by implementing tact and outstanding communication and interpersonal skills. Assisting in standing up to FDIC enterprise-wide command center (EWCC) by developing a phased approach and leveraging existing staffing, applying infrastructure monitoring tools and utilizing existing support equipment. Proactively repurposed escalation managers as incident managers to be more compatible with ITIL and ITSM principles. Headline : 6+ years of experience as a Sr. Operations Analyst. Highly accountable and efficient team player is seeking a long-term position with a reputable and diverse organization that fosters a healthy culture. The ideal environment values consistent performers and offers results-oriented upward mobility to those with leadership qualities, disciplined organization, and a strong business acumen. Skills : Project Management MS Office Change Management MS Project, Visio Data Analysis, Reporting, And Presentation SharePoint Process Analysis, Revision, And Documentation Salesforce Adult, Training And Learning Methodologies Access. Independently managing OPS improvements for eight departments and staff of 500. Core duties include project management, IT coordination to resolve bugs and enhancement needs, process analysis/revision, issue management, and priorities. Developing effective and influential relationships with a diverse group of business. Partners; provide recommendations based on best practices/methodologies. Successfully execute small to mid-scale projects for the COO and internal clients. Running project teams, providing reporting/recommendations to leadership. Maintaining project plans, redirecting with changing needs, and meeting deadlines. Change control, pre-release training, release support, and post-release analysis. Skilled at researching user stories, interpreting customer needs through quantitative and qualitative data, influencing internal stakeholders, and proposing viable solutions. 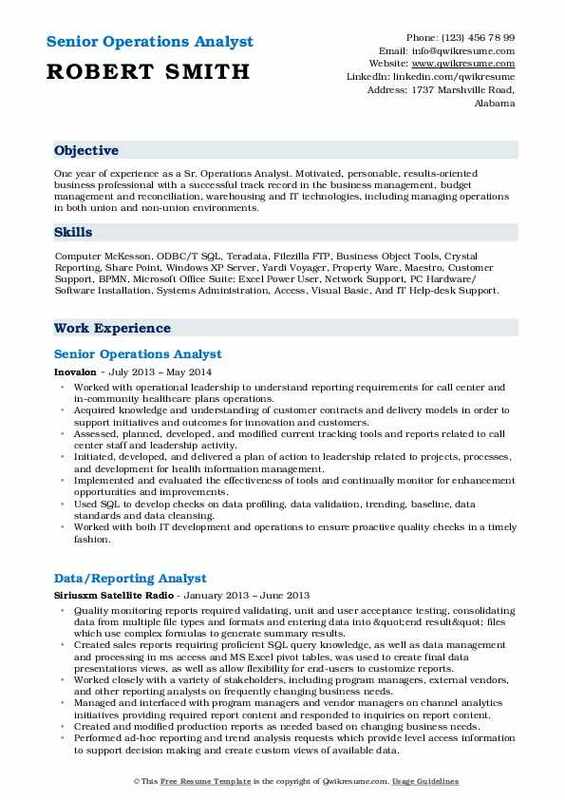 Summary : I have 16+ years of experience in the IT field as a Senior Operations Analyst, and always wanting to learn more. I'm sure with my experience and combining any new knowledge would be a great asset to a company. Skills : Hardware Cross-platform Systems, Unix, Linux, Windows, And Mainframe. Worked On And Tested Before Implementing Different Software On Cross-platform. Applications Worked On Are Autosys 4.0 And Autosys R11.3.5, Remoteware (SYSBASE/SAP), And CA Workload Automation IXp 11.3.5. Plan and coordinate the installation of software, hardware and data communication updates and enhancements; analyze cost-effectiveness and long-term feasibility. Recommend and implement enhancements to processes or system inventory. Provide direction to assigned staff to meet new system development and user requirements. Supervise daily activities of the team of 5-6 console operators; mentor and train the team on new or upgrade software. Quality assurance (QA) on all testing of new or revised jobs before they are placed into production. Resolve production problems, queries, emergencies and issues affecting the quality or availability of services. Monitor and recommend standards for software and hardware. Maintain reports and logs for backups and server changes. Create and roll-out disaster recovery procedures for use across locations. Create scripts to implement security for PGP encryption and PKZIP over cross-platforms and applications. 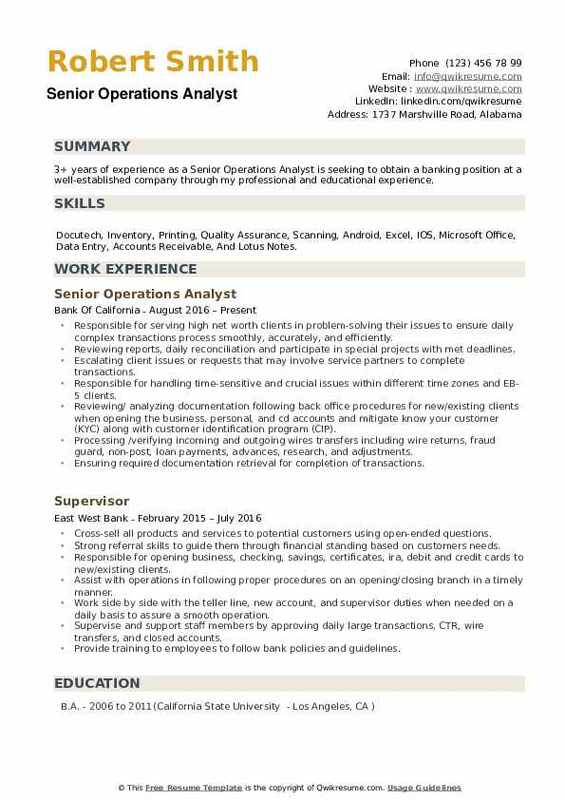 Objective : 3+ years of experience as a Senior Operations Analyst is seeking to obtain a banking position at a well-established company through my professional and educational experience. Skills : Docutech, Inventory, Printing, Quality Assurance, Scanning, Android, Excel, IOS, Microsoft Office, Data Entry, Accounts Receivable, And Lotus Notes. Responsible for serving high net worth clients in problem-solving their issues to ensure daily complex transactions process smoothly, accurately, and efficiently. Reviewing reports, daily reconciliation and participate in special projects with met deadlines. Escalating client issues or requests that may involve service partners to complete transactions. Responsible for handling time-sensitive and crucial issues within different time zones and EB-5 clients. Reviewing/ analyzing documentation following back office procedures for new/existing clients when opening the business, personal, and cd accounts and mitigate know your customer (KYC) along with customer identification program (CIP). Processing /verifying incoming and outgoing wires transfers including wire returns, fraud guard, non-post, loan payments, advances, research, and adjustments. Ensuring required documentation retrieval for completion of transactions. Performing account maintenance by adding/removing signers and title changes.